iLearning at San Domenico School: IT - Not Your Father's "Instructional Technology"
IT - Not Your Father's "Instructional Technology"
Back in the 1982-1983 school year I spent a pretty good amount of time as an assistant to a research project through the Laboratory for Comparative Human Cognition in the Communication Department of the University of California, San Diego. Back in those days "Instructional Technology" was a term used to describe computer-based learning. 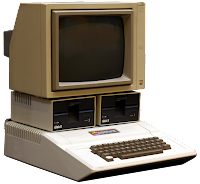 The research project was predominantly focused on trying to determine the educational value and efficacy of "drill and practice" software on Apple II computers. Looking back at some of the research from that time it's surprising to me how similar the work was compared to what we do with technology in education today. Today, the term "IT" means something quite different as the "instructional" part of the phrase has been replaced with "educational." The reason for this change is directly connected to the phrase "Information Superhighway" which came a few years after my time at LCHC and referred to the Internet and the astronomic growth of electronic information. Today IT refers to the availability of this vast and growing amount of information. IT staff provide support for the access to, and the use of, this information. In schools, businesses, and governments IT staff serve a crucial role in building, managing, troubleshooting, and yes even providing instruction on the use of a wide range of information technologies. At San Domenico School a big part of the Technology Department is the IT staff that are such a vital part of the day to day operation as well as the educational program of the school. We don't just provide our staff with computers, iPads, printers, media, and broadband wired and wireless network connectivity and then ask them to use it and fix it if it breaks or no longer meets their needs. To use the classic metaphor, we need to keep the trains running. More importantly, we need to make sure people know how to run the trains, that they have the best possible trains available for the tracks they are driving on, and we need to assist them in determining if the tracks and trains they are using are the right ones to support the educational mission of our school. Meet our IT staff. These are the people who help us keep the trains running. Jason Clarke is our Technology Systems Manager. Jason is originally from New York but his family moved to California where he graduated from Tamalpais High School with letters in two sports. He studied Information Technology at the Lincoln Technical Institute and has held technology management positions at MySpace, FOX, and Rubicon. Jason is in his fourth year at San Domenico School where he manages the day to day operations of the IT systems and staff and helps with youth sports including serving as an assistant coach for the flag football program. Alec Barnhardt is Technology Support Specialist serving his second year at San Domenico School. Alec spent one summer as a camp counselor and four years as an assistant teacher and technology and IT support coordinator for the British International School in New York. In 2002 he was an 8th grade basketball coach in the Bolinas-Stinson School District. In 2003 Alec worked as an educational tutor for students with learning differences in the Bolinas-Stinson School District. Alec holds certifications as an Emergency Medical Technician and as an ambulance driver. Robert Valdivia is Technology Support Specialist at San Domenico School. Robert joined the Technology Department in the spring of 2013. Robert is originally from Lima, Peru. His family immigrated to California when he was just two years old. After attending Gallinas (now Venetia Valley) Elementary, Davidson Middle, and Terra Linda High School, Robert moved to Hollywood and graduated from the Musician's Institute where he studied vocal performance. He also studied sound design at the Ex'pression College for Digital Arts. Robert has worked in corporate IT and spent two years working at the Corte Madera Apple Store where he earned several certifications in Apple hardware and software products. San Domenico School is at the forefront of educational technology use in schools. Being one to one with iPads in grades 3 - 12 requires a strong team of IT professionals to help support the hundreds of users integrating these educational tools every day. Here's to Jason, Alec, and Robert! Thanks for keeping the trains on time, for making sure we have the best available tools, and for all you do to help us grow and use these powerful educational resources throughout the school.